Aim and Objectives: The aim of this study was to test the dentinal tubule penetration of mineral trioxide aggregate (MTA) Fillapex (Angelus, Londria, PR, Brazil), GuttaFlow® 2 sealer (Coltene/Whaledent) with standard sealer AH Plus (Dentsply Detrey, Konstanz, Germany) in instrumented root canals obturated by using cold lateral compaction techniques in either the presence or absence of the smear layer. Materials and Methods: Sixty extracted human mandibular premolars with a single root canal were used for this study. All teeth were prepared using F2 Pro Taper nickel–titanium rotary system. Teeth were randomly divided into three groups of 20 teeth each. GuttaFlow 2, MTA Fillapex and AH Plus were used as sealers in Group I, Group II, and Group III, respectively. Groups were divided into two subgroups in which either the smear layer was removed or retained. Removal of smear layer was achieved by continuous irrigation with 5.25% sodium hypochlorite and 2 ml of 17% ethylenediaminetetraacetic acid. The canals were dried and obturated using respective sealers by cold lateral compaction techniques. After storage at 37°C and 100% humidity for 14 days, the roots were then split into two halves using chisel and mallet. On each section, sealer penetration in the dentinal tubules at cervical, middle, and apical levels was examined by using scanning electron microscope. Results: Sealer penetration into the dentinal tubules was noticed in all groups. AH plus showed deeper penetration, followed by MTA Fillapex and GuttaFlow® 2. The penetration depth of the sealers at the cervical and middle third of root was significantly more than those at apical third. Conclusions: Within the parameters of the present study it was concluded, with the removal of smear layer AH plus sealer showed deeper penetration into the dentinal tubules at cervical and middle third of root compared with apical third. Successful endodontic treatment requires the thorough removal of vital and through chemo-mechanical means, followed by three-dimensional obturation to prevent ingress and egress of fluids to prevent bacterial contamination or regrowth. Prior to the obturation phase, the clinician must establish the proper shape and size of the root canal. Today's clinicians have a number of methods, materials and technologically advanced instruments at their disposal to achieve these goals. Among various obturation techniques cold lateral compaction stands as a practical and reliable method, by using this technique, the pulp space can be obturated effectively. Gutta-percha is considered as a “gold standard” filling material. Though it has many desirable properties yet it solely fails to provide an effective three-dimensional seal. To overcome this insufficiency, endodontic sealers are used in conjunction with gutta-percha. According to Orstavik, sealers play an important role in sealing the root canal system with entombment of remaining microorganisms and filling of inaccessible areas of the prepared canal. Newer generation sealers are being engineered to improve their ability to penetrate into dentinal tubules or bond to both the dentin and core material surfaces. AH Plus (Dentsply DeTrey, Konstanz, Germany) is a widely used epoxy-resin based sealer and possesses positive handling characteristics and superior physical properties. Mineral trioxide aggregate (MTA) Fillapex (Angelus, Londrina, PR, Brazil) is a new calcium silicate–based sealer containing MTA, salicylate resin, natural resin, bismuth oxide, and silica. The formulation is proposed to possess the advantages of MTA, a mineral known to have favorable biocompatibility, antimicrobial activity, and good sealing ability. GuttaFlow ® 2 sealer (Coltene/Whaledent) is a cold flowable filling system, combining sealer and gutta-percha in one product. It consists of a polydimethylsiloxane matrix highly filled with very finely ground gutta-percha. It has exceptional chemical and physical properties; also material has good adaptability because of increased flowability and the fact that it expands slightly. The main hindrances during shaping and cleaning is the formation of a smear layer which behaves as an infection route and substrate for bacterial growth; this negatively affects the penetration and adhesion of obturating materials on to the dentinal tubules. The aim of this study was to test the dentinal tubule penetration of AH Plus (Dentsply Detrey, Konstanz, Germany) MTA Fillapex (Angelus, Londria, PR, Brazil) and GuttaFlow ® 2 sealer (Coltene/Whaledent) in instrumented root canals obturated by using cold lateral compaction techniques in either the presence or absence of the smear layer. Sixty extracted single-rooted human mandibular premolar teeth were used in the study. After extraction all teeth were stored in physiological saline solution until use. The crowns were removed at the cementoenamel junction with a high-speed fissure bur under water cooling. A #10 k-file was introduced into the canal and advanced until it was just visible at the apex and then retracted 1 mm to establish the working length. A glide path was verified or established using k-files # 10 to 25. All the roots were instrumented till F2 ProTaper file (Dentsply Maillefer). All the samples were divided randomly into three groups of 20 teeth each (Group I, Group II and Group III). The decoronated tooth samples under subgroups Ia, IIa, and IIIa were irrigated with 2 ml of 17% ethylenediaminetetraacetic acid (EDTA) for 3 min, followed by 3 ml of 5.25% sodium hypochlorite for 1 min to remove the smear layer and expose the dentinal tubules. The decoronated tooth samples under subgroups Ib, IIb and IIIb were irrigated with 3 ml of 5.25% sodium hypochlorite for 1 min, followed by distilled water for 1 min. Canals were dried using paper points. Lateral compaction technique was applied for the obturation of samples using 6% gutta-percha points (Dentsply Maillefer) as an initial cone, followed by filling of any remaining space with accessory cones by using finger spreader #20. Manufacturer's instructions were followed for the manipulation of each sealer material. Ib - Root canals of teeth filled with GuttaFlow 2 without removal of the smear layer. IIb - Root canals of teeth filled with MTA Fillapex without removal of the smear layer. IIIb - Root canals of teeth filled with AH Plus without removal of the smear layer. Radiographs were taken from buccal and mesial aspects to verify the quality of the root canal fillings, and access cavities were sealed with glass ionomer cement. The specimens were kept in an incubator at 37°C and 100% humidity for 2 weeks. Each root was split into two by placing parallel longitudinal grooves on the full length of buccal and lingual surfaces, which did not penetrate the root canal. The roots were then split into two halves using chisel and mallet. The root segments were examined under scanning electron microscope by mounting the samples on an aluminum stub, coated with gold atoms. Considering the canal wall as the starting point the maximum and minimum depth of sealer penetration in the dentinal tubules was measured (microns) at cervical, middle and apical third of root. The effects on sealer penetration depth of the sealer type were analyzed by performing variance test analysis of variance and Tukey's post-hoc tests. A P value of 5% was considered as the level of statistical significance. Tubular penetration was observed in all the groups. All the data were collected, the mean depth of tubular penetration of sealers and standard deviation in different experimental groups at different levels were presented in [Table 1]. Statistical analysis [Table 2] showed that there was a statistically significant difference between each group at each level, and also between different levels within each group (P< 0.05). The images taken in a scanning electron microscope (SEM) are shown in [Figure 1]. When groups were compared statistically, significant differences were found between Groups I, II, and III (P< 0.05), indicating that AH Plus showed the greatest sealer penetration regardless of the use of EDTA. Significant differences were found in sealer penetration where subgroups was treated with EDTA as a smear layer removal agent. Statistically significant differences were found in apical third as compared with cervical and middle third of root (P< 0.05). Successful root canal therapy consists of thorough cleansing and shaping and requires complete obturation of the root canal system with an inert material. An ideal obturating material should adapt well to the root canal walls and this can be accomplished by solidly compacting gutta-percha and sealer into a homogeneous mass. The physicochemical composition of endodontic sealers plays an important role in bond strength, tissue tolerance, and antimicrobial activity., The clinical importance of sealer tags is to improve the adaptation as well as retention of the core material on the dentinal wall. The importance of smear layer removal has been investigated by number of authors (Oksan et al., 1993, Kouvas et al., 1998, Kokkas et al., 2004). It has been suggested that the decreased micro-leakage associated with smear layer removal may be attributable to the deeper penetration of sealer into dentinal tubules.,, Many researchers had suggested that the use of sodium hypochlorite combined with 17% EDTA was more effective for smear layer removal. Beltz et al., reported that sodium hypochlorite dissolves 90% of organic component of dentin and 17% EDTA dissolves 70% of inorganic components; the researchers suggested that using 10 ml of 17% EDTA for 1 min is the most effective method of smear layer removal. Mohsen et al., suggested that 17% EDTA was more effective in the removal of smear layer from coronal and middle third as compared to the apical third. Gharib et al., in a similar study, found that there were significantly less percentage and depth of penetration of sealer in apical sections than in the coronal and middle sections. This study is also in agreement with it as it demonstrated that more amount of sealer penetration in the coronal, followed by the middle and apical section. In the present study, GuttaFlow 2 showed following sealer penetration at cervical, middle, and apical third. Group Ia showed (18.42 ± 2.80, 18.92 ± 1.8 and 4.50 ± 1.15) and Group Ib showed (3.06 ± 1.4, 2.28 ± 0.48 and 1.49 ± 0.29) which was much lower than MTA Fillapex. The difference was found to be statistically significant (P< 0.05). The presence of silicone in the polydimethylsiloxane-based GuttaFlow 2 sealer, which possibly produces high surface tension forces, thus making its spreading on dentin difficult. Besides, its film thickness is higher than that of MTA Fillapex and AH Plus, this makes GuttaFlow 2 penetrate lesser into dentinal tubules. Regional disparity may be explained on the basis of anatomic complexities in the apical portion of the root canal. This area is characterized by irregular and variable dentinal structure such as areas of resorption, presence of cementum-like tissue, atubular dentin and occasional pulp stones. Furthermore, the tubule size and number reduces in this area. Another possible explanation for this may be the reduced effectiveness of smear layer removal techniques and agents in the apical third. Findings of this study concurs with that of Patel et al., and Sen et al., who reported that mean maximum penetration in the cervical and middle third was greater than at the apical third. Scanning electron microscopy offers a number of advantages where the images produced using SEM allows highly detailed observation of the dentinal tubules and the integrity and the surface appearance of the sealer cement. The adaptation of the sealer cement to the tubule can be seen in detail at high magnification. It allows the observation of sealer cement within the tubules at distant sites from the canal wall where the density of the tubules is less. It also allows accurate measurement of penetration depths. The penetration depth of the sealers at the cervical and middle third of root was significantly more than those at apical third. Kuçi A, Alaçam T, Yavas O, Ergul-Ulger Z, Kayaoglu G. Sealer penetration into dentinal tubules in the presence or absence of smear layer: A confocal laser scanning microscopic study. J Endod 2014;40:1627-31. Peng L, Ye L, Tan H, Zhou X. Outcome of root canal obturation by warm gutta-percha versus cold lateral condensation: A meta-analysis. J Endod 2007;33:106-9. Patil SA, Dodwad PK, Patil AA. Anin vitro comparison of bond strengths of Gutta-percha/AH Plus, Resilon/Epiphany self-etch and EndoREZ obturation system to intraradicular dentin using a push-out test design. J Conserv Dent 2013;16:238-42. Orstavik D. Materials used for root canal obturation: Technical, biological and clinical testing. Endod Topics 2005;12:25-38. Bouillaguet S, Shaw L, Barthelemy J, Krejci I, Wataha JC. Long-term sealing ability of Pulp Canal Sealer, AH-Plus, GuttaFlow and Epiphany. Int Endod J 2008;41:219-26. Dua A, Dua D, Uppin VM. Evaluation of the effect of duration of application of Smear Clear in removing intracanal smear layer: SEM study. Saudi Endod J 2015;5:26-32. Kokkas AB, Boutsioukis AC, Vassiliadis LP, Stavrianos CK. The influence of the smear layer on dentinal tubule penetration depth by three different root canal sealers: Anin vitro study. J Endod 2004;30:100-2. Oksan T, Akener B, Sen B, Tezel H. The penetration of root canal sealers into dentinal tubules. A scanning electron microscopic study. Int Endod J 1993;26:301-5. Kouvas V, Liolios E, Vassiliadis L, Parissis-Messimeris S, Boutsioukis A. 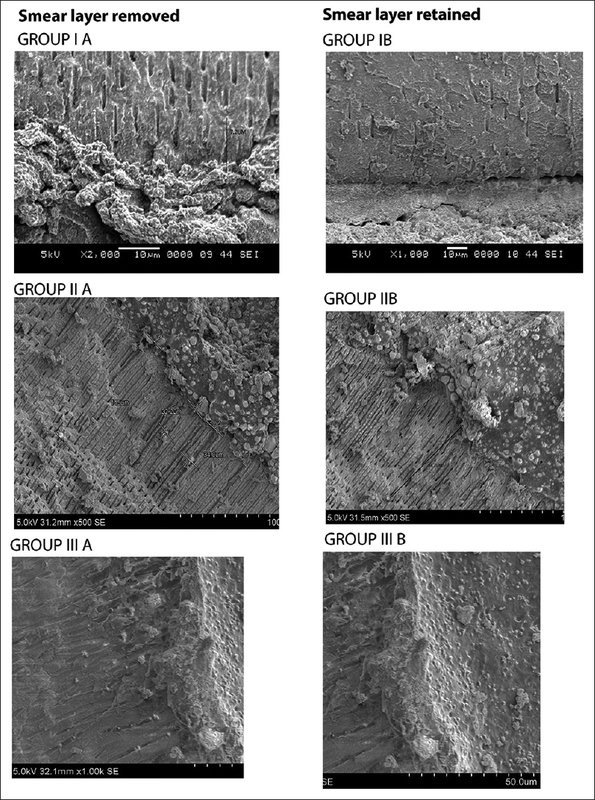 Influence of smear layer on depth of penetration of three endodontic sealers: An SEM study. Endod Dent Traumatol 1998;14:191-5. Beltz RE, Torabinejad M, Pouresmail M. Quantitative analysis of the solubilizing action of MTAD, sodium hypochlorite, and EDTA on bovine pulp and dentin. J Endod 2003;29:334-7. Gharib SR, Tordik PA, Imamura GM, Baginski TA, Goodell GG. A confocal laser scanning microscope investigation of the epiphany obturation system. J Endod 2007;33:957-61. Zhou HM, Shen Y, Zheng W, Li L, Zheng YF, Haapasalo M. Physical properties of 5 root canal sealers. J Endod 2013;39:1281-6. Bouillaguet S, Bertossa B, Krejci I, Wataha JC, Tay FR, Pashley DH. Alternative adhesive strategies to optimize bonding to radicular dentin. J Endod 2007;33:1227-30. Iqbal MK, Sijiny R, Al-Zaidan H. A comparison of sealing ability of four sealer cements in apically perforated root canals. Saudi Endod J 2011;1:12-8. Tummala M, Chandrasekhar V, Rashmi AS, Kundabala M, Ballal V. Assessment of the wetting behavior of three different root canal sealers on root canal dentin. J Conserv Dent 2012;15:109-12. Saraf-Dadpe A, Kamra AI. A scanning electron microscopic evaluation of the penetration of root canal dentinal tubules by four different endodontic sealers. A zinc oxide eugenol-based sealer, two resin-based sealers and a Polydimethylsiloxane-based sealer: Anin vitro study. Endodontology 2012;24:50-8. Sen BH, Piskin B, Baran N. The effect of tubular penetration of root canal sealers on dye microleakage. Int Endod J 1996;29:23-8. Ayad MF, Farag AM, Garcia-Godoy F. Effect of lactic acid irrigant on shear bond strength of epiphany adhesive sealer to human dentin surface. Oral Surg Oral Med Oral Pathol Oral Radiol Endod 2010;109:e100-6.